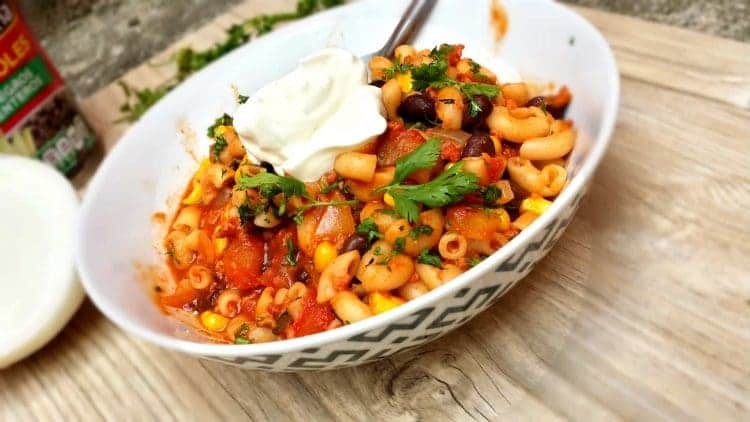 Chili mac was one of those things in my family that was perfect for a rainy day or a family BBQ. Any day that called for some good ‘ol comfort food, chili mac was the perfect option. 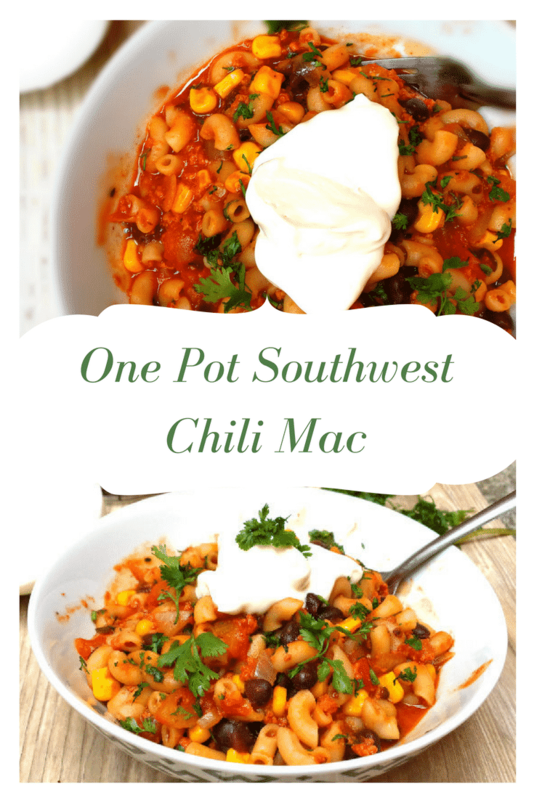 To put my own spin on this classic favorite, I’ve switched out and added a few more ingredients to make this One Pot Southwest Chili Mac. 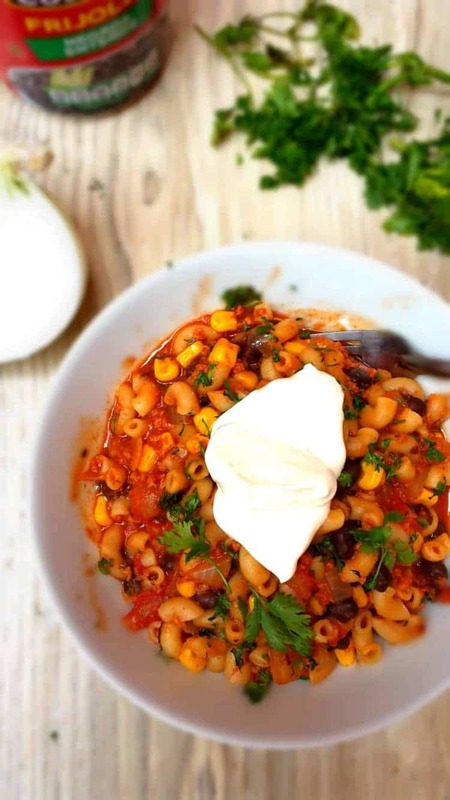 If you’ve tried the Chili Mac recipe on All She Cooks, you’ll want to try this recipe too! One of the things I always hated about making chili mac was using so many dishes because I HATE washing dishes (Who doesn’t? Am I right?). One pan for the meat, one pan for the noodles, one pan for….stop right there! Let’s just make everybody happy and turn this into a one pot meal! Also, by turning this into a one pot meal, the noodles have a chance to soak up all that chili goodness, allowing the flavors to get nice and friendly. To make this recipe I used chorizo which is a Mexican spicy sausage. Since I live in Mexico, chorizo is cheap and easy to come by. I understand that that is probably not the case for most and chorizo could be hard to find in some areas. If you can’t seem to find chorizo in your area, or just prefer to use something else, pretty much any other ground meat would work well in this recipe, beef, turkey, chicken or veg-friendly meat substitute would all be great options for this recipe. This recipe also calls for a few tablespoons of chipotle or adobo sauce. Again this ingredient may not be as easy to find in the states as it is in Mexico. However, most grocery stores have an ethnic foods isle where you’ll find taco shells and salsas. The adobo sauce helps to add a good smoky flavor to the pot, but if it is not available in your area, your favorite salsa will also do. Or better yet here is my recipe for Put-On-Everything Chipotle salsa! In a large pot, add chorizo, stirring occasionally until thoroughly cooked through. Add diced onions and tomatoes and cook for a few more minutes until softened. Add tomato puree, cumin, beans, corn and adobo sauce and stir until well combined. Pour in noodles and water. Stir to combine, lower heat, cover and let simmer for about 15 minutes stirring occasionally. To serve top with cilantro, sour cream and cheese.